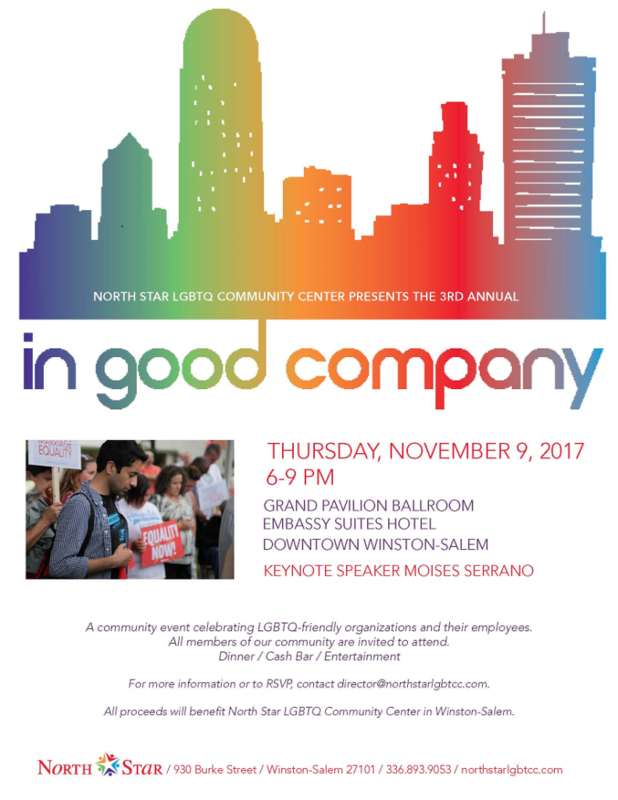 On Thursday November 9th North Star LGBTQ Community Center will host the third annual IN GOOD COMPANY from 6-9pm at the Grand Pavilion Ballroom in the Twin City Quarter in downtown Winston-Salem. This year marks the 15th anniversary of the Human Rights Campaign (HRC) Corporate Equality Index (CEI). The Index measures the degree to which corporations across America embrace workplace diversity and demonstrate fair practices for LGBTQ (Lesbian, Gay, Bisexual, Transgender, Queer) employees. While HRC has recognized LGBT-friendly corporations at national and state galas, Winston-Salem has never properly acknowledged and celebrated local employees and corporate affiliates for their commendable workplace practices. Local organizations with scores ranging from 80-100 on the Index include Bank of America, Blue Cross Blue Shield of North Carolina, Food Lion, Kilpatrick Townsend, Pepsico, Suntrust, Wells Fargo, and Womble Carlyle Sandridge & Rice. IN GOOD COMPANY is an event to honor and celebrate LGBT-friendly employers and their employees. Local LGBTQ-friendly small businesses, nonprofits and open and affirming faith communities will also be invited to the celebration. All proceeds from IN GOOD COMPANY will benefit North Star LGBTQ Community Center in Winston-Salem. The Center opened in September 2013 with a mission to enrich the lives of the LGBTQ community by providing a safe and accepting place for people of all ages and backgrounds. For more information on North Star, please visit northstarlgbtcc.com. – Event/table sponsorships are available starting at $500 for small business/non-profit and $1000 for corporate business (see 2017 Sponsorship Packet for details). – For Profit Organizations may purchase full ($2500) or half ($1000) tables seating up to a total of ten employees/guests. Individual seats are $150/guest. – Individuals, Nonprofit Organizations and Small Businesses (less than 50 employees) may purchase full ($500) tables seating up to a total of ten guests. Individual seats are $75/guest. – Companies/Organizations may sponsor tables for nonprofit or local community organizations (including local high school Gay Straight Alliance clubs). – Encourage LGBTQ employees and allies to serve as corporate ambassadors for the event. – Nominate an LGBTQ employee or ally who has demonstrated a commitment to diversity and inclusion within your organization to be recognized as an IN GOOD COMPANY award recipient. A limited number of scholarships are available for individuals demonstrating financial need and/or verifiable volunteer hours with the local LGBT community. We hope you will join us for this important event celebrating workplace diversity. Thank you for supporting North Star LGBTQ Community Center, IN GOOD COMPANY, and a more inclusive community. North Star LGBTQ Community Center is an independent 501(c)3 nonprofit organization. All donations are tax deductible. Thank you for supporting Equality Winston-Salem, North Star LGBTQ Community Center, IN GOOD COMPANY and a more inclusive community. Equality Winston-Salem is a temporary fund of The Winston-Salem Foundation. North Star LGBTQ Community Center is an independent 501(c)3 nonprofit organization. All donations are tax deductible.